I love mexican food. Like my mother, I could probably eat it everyday. Limited access to great mexican food is just one of the reasons living outside of California borders on torture for me. The Mission District in San Francisco offers a myriad of taquería options, but not all super burritos are created equal. Jordan and I have done the legwork and our favorite taquería is Taquería Cancun (2288 Mission Street, between 18th and 19th). Last Saturday we enjoyed awesome burritos in the company of awesome friends. Our recommendation: go for the super burrito or super taco “al pastor” ($6, $3). What does al pastor entail you may wonder? How can this meat be so delicious? Well, al pastor means that slices of pork are marinated in chilis and vinegar and then are cooked shawarma-style with a pineapple on top. I have to say that love the image of a pile of meat roasting on a spit with a pineapple on top almost as much as I love a super burrito al pastor! Our friend Jeff took our recommendation and got the super burrito al pastor, another friend went with the chicken burrito and another went vegetarian. None were disappointed. After we finished our burritos we took a stroll through the neighborhood. Afterwards we grabbed soft-serve ice cream at Bi-Rite Creamery. I happen to think soft serve pairs magnificently with burritos. The perfect end to a perfect day in the Mission. Emily and I celebrated our fifth anniversary last week, so we treated ourselves to a nice dinner. Since it falls so close to the holidays, we choose not to purchase each other gifts, but we still splurged a bit for a nice meal. 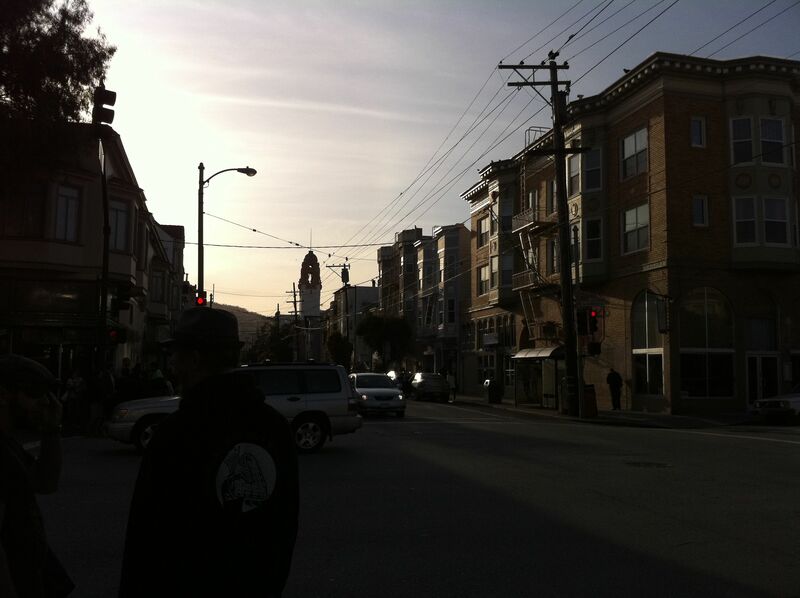 After much deliberation, we settled on Bar Tartine in the mission, on Valencia between 16th and 17th. The “bar” is more of a restaurant that happens to have bar seating; this trait usually lends itself to a cozy and intimate dining experience, and Bar Tartine is no exception. Because of this, I would now like to apologize in advance for the lack of photos; the tables are fairly close together and the lighting from the antler chandelier was not exactly photo friendly. As well as being cozy, the space feels calm and the creative touches are interesting. Bar Tartine kind of sums up what the food and people are like in this part of the mission; it shares this with its sister eatery: Tartine bakery. 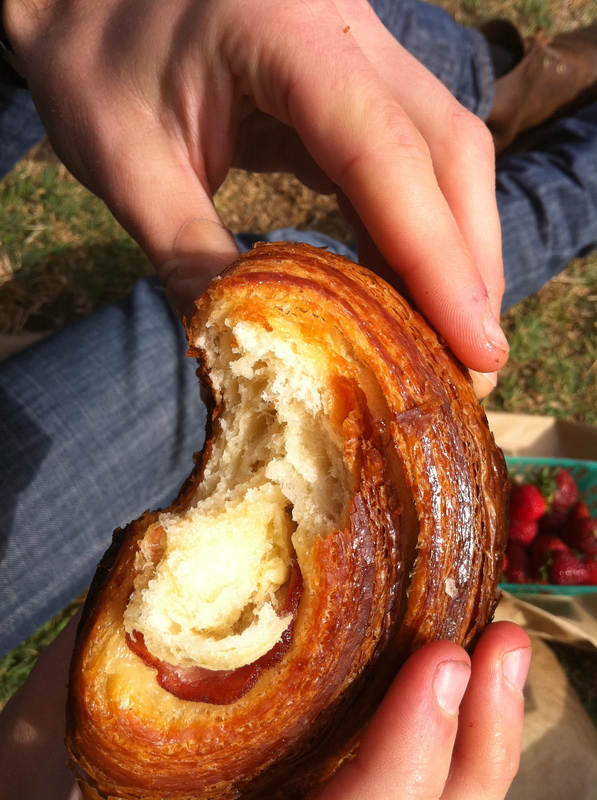 There’s another thing it shares with Tartine Bakery: the quality of the food. We decided to neglect the traditional dining progression and instead shared the four things on the menu that looked best. First was a frisée salad with prosciutto and a soft boiled egg ($9). The greens were fresh and dressed very well, the egg was cooked perfectly, and the cooked prosciutto added a satisfying crispy component. This was a good salad, but a bit forgettable. Also, I’m not a huge fan of prosciutto prepared in this way; I think you lose most its the subtlety as well as the delicacy of the fat which melts on your tongue. For this salad, I think bacon would have been a better choice. Next was the big one: bone marrow ($15). Three bones with a garlicky, herby, crusty top filled with what can only be described as butter of the gods. Imagine the most meaty, perfectly salty, creamy, deliciousness and spread it on toasted Tartine bread (which is also wonderful). We’ve had bone marrow other places and it’s almost always great, but this is something special. For a main course, we shared the boudin noir ($24). Blood sausage is one of my favorite treats; I fell in love with it at a parrilla in Uruguay and indulge in this porky, creamy sausage whenever I can. It may sound gross, but trust me, it’s not. Bar Tartine put forth a good effort resulting in probably the second best I’ve had, defeated only by my first love from Uruguay, but that was an emotional day for me (soooo much good food). Okay, I’ll stop reminiscing and get back to the meal. The boudin was served with braised cabbage and sweet potatoes, both of which complimented the sausage very well. To accompany our main dish Emily and I indulged in yet more of Tartine’s lovely bread; this time it came in the form of a savory bread pudding with leeks and plenty of pepper ($6). It was super crispy on top, and creamy and hearty in the middle. This final course was loaded with flavor and we were ready to move onto something sweet. Everything that comes out of the bakery is perfect, so we had to get something from Bar Tartine’s dessert menu. While the menu looked interesting, the night we were there they had run out of a couple things, so we settled on the Passion Fruit Lime Bavarian ($7.5). The cake was very nice and the passion fruit and lime filling was fantastic (by the way, passion fruit is like the bacon of the dessert realm, so we MUST eat it when it’s available; it’s compulsive and not our fault), the only downside was that this cake is also served at Tartine Bakery so it didn’t seem as special or unique. Conclusions: The meal was great and although we didn’t follow the traditional dining format it allowed us to try all the things we wanted without spending too much or eating an obscene amount. If I had to sum up Bar Tartine in one sentence, I would say: it’s good, simple food with the flavor dial turned up to 11. This is definitely the place to go for uncomplicated food executed wonderfully. It’s no secret that Jordan and I both love pizza. We’ve walked by Pizzeria Delfina (18th and Guerrero in the Mission), and its sister restaurant Delfina several times and always been jealous of the diners. The food looks and smells incredible, there’s great outdoor seating and always a crowd waiting. So after a Greyhound happy hour at Doc’s Clock (21st and Mission), we decided to treat ourselves to pizza. We strolled over, put our name in and were seated outside with our pup almost immediately. (I was shocked that we were seated so quickly, but I guess we just had perfect timing because a serious crowd had formed as we finished our meal). The waitress brought us breadsticks and a little dish of parmesan, chili flake and oregano to start (and a bowl of water for Willow – very sweet). We ordered two pizzas – the margherita ($12.5) and the special funghi ($16), which had maitake mushrooms and fontina cheese. The pizzas were wonderful! They both had a nice balance between bread, sauce, cheese and toppings. For me, the funghi pizza was out of this world. The mushrooms were so earthy and they paired perfectly with the fontina cheese. 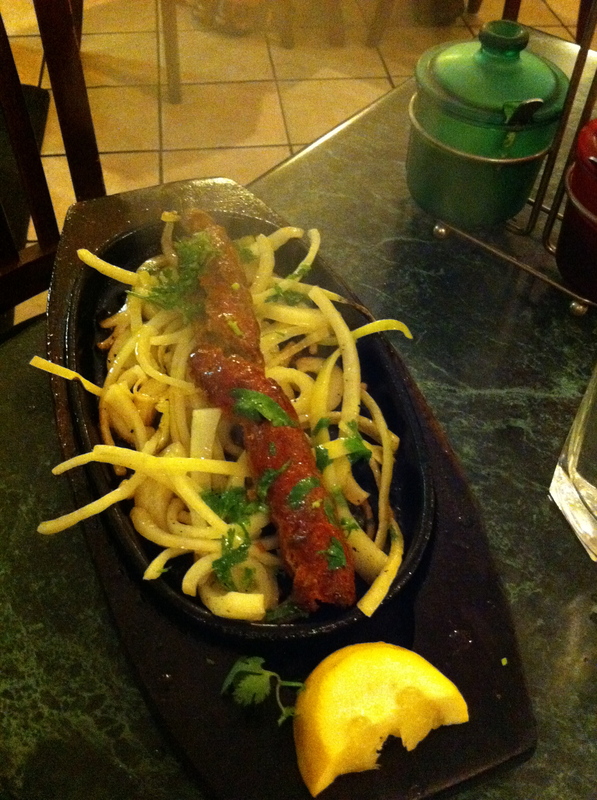 Overall, I really enjoyed the whole experience – great atmosphere, wonderful food, a well-behaved dog. We stopped by Bi-Rite Creamery for a gigantic soft-serve ice cream cone ($3) for dessert. The vanilla was delicious, the chocolate mint was a little overpowering. I’ll stick with just vanilla next time. Conclusions: We’d go back to Pizzeria Delfina in a second. I kind of want to go again tonight! It was Monday night. I had just gotten home from work. It was 80 degrees in our apartment (in November! in San Francisco!). We had no ideas for dinner and the thought of turning on the oven was just too much. We decided to go out. I told Jordan that I wanted to eat something light on a cool, quiet patio. Also, I didn’t want to walk far. While I thought this request impossible, my sweet Jordan found exactly what I was looking for in Hyde Street Bistro, just a few short (but uphill) blocks from our apartment. Hyde Street Bistro (Hyde and Pacific) is a small, farm to table French restaurant. It is positively adorable, the wait staff is charming, the food is simple and French. We sat outside at a small bistro table under a tree decorated in white twinkle lights, the drone of the cable car tracks in the background. For sidewalk seating (especially in our colorful neighborhood), it was nice and quiet. I was quite pleased and I hadn’t even ordered. We started with the butter lettuce salad with honey cider vinaigrette ($7). Simple, acidic, slightly sweet – a nicely composed salad. We then ordered the mussels mariniere ($14), fries ($5) and fresh vegetable sauté ($5). The mussels were delicious – you can’t go wrong with shallots, wine, parsley and butter. The fries were crisp and well-seasoned. The aioli that was served with them was also nice. The vegetables left something to be desired, although they were an appropriate crisp-tender. Nicely done, quickly prepared, simple and satisfying. Overall, Hyde Street Bistro was exactly what I wanted: a light meal eaten outside on a quiet patio with no dishes for me to clean up afterward. Great pick Jordan! In addition to a full French menu, they also have a happy hour from 5:30 – 7 with $3 draft beers, $5 glasses of wine and $10 mussels with fries. We certainly will be back! Jordan and I both really enjoy sushi, but so far we have not found a place in San Francisco that can hold a candle to Mikuni in Roseville. We’ve tried several different restaurants in our neighborhood, and last Saturday we went to Nara Sushi at Polk and California. I’ll keep this short. Skip the tempura appetizer ($5) and dive straight into the fish. We ordered the chirashi ($17). The portion was generous with about 3 pieces each of 7 different fish and the quality was good. The sushi rice was also tasty. Still a little hungry after finishing the chirashi, we ordered a spicy tuna, shrimp and masako roll off the special board ($12). It was also a generous portion and quite tasty, but a bit spicy. Overall, the atmosphere was typical, the service was attentive and the fish was good – certainly the best out of the restaurants we’ve tried in our area. Regardless, we were still left longing for Mikuni and are looking forward to going back to Granite Bay for Thanksgiving (hint hint!). 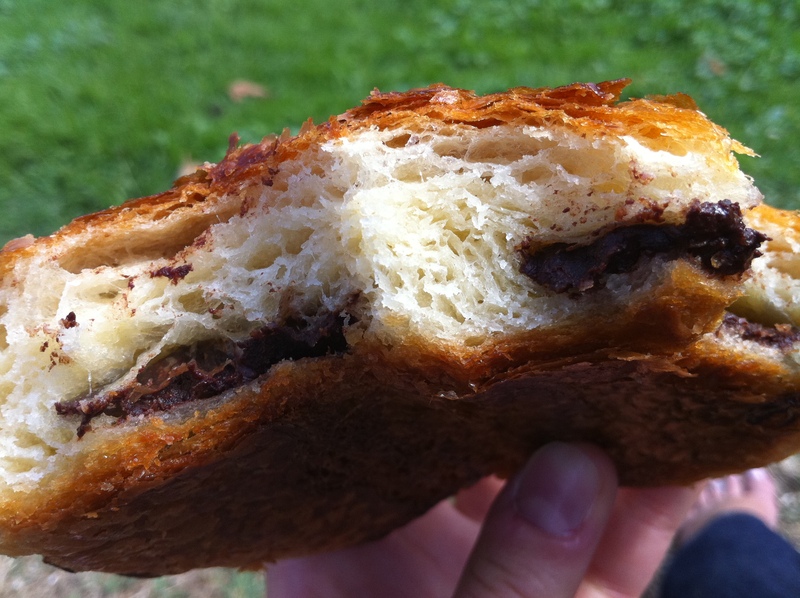 … pain au chocolat, pain au jambon, eclair, lemon cream tart, chocolate pudding. I’ve yet to consume a pastry or dessert that I did not like. Many I have loved. Loved so much that Jordan and I make an almost weekly pilgrimage to consume their perfect treats. We even wait in a line that wraps out the door and down the block. Yes, it is that good. Their coffee, roasted by Four Barrel Coffee of San Francisco, is also delicious – balanced and strong, but not bitter. I’d also recommend fresh fruit or orange juice to cut the decadence of their pastries. And lastly, ditch the crowds, walk down the block to Dolores Park, eat in the sunshine and watch the parade of dogs go by. Ahhhh, a perfect morning. Nope, I’m not trying to be cute by titling my post tacolicious … the restaurant is actually called Tacolicious. Although a bit put off by such a silly name, I decide to take the plunge anyway and order tres tacos from the Tacolicious stand at the Thursday Farmer’s Market at the Ferry Building. I ordered one carnitas taco, one braised beef short rib taco and one bean and summer squash taco. $9 seemed a bit steep for three tacos, but I was eating at the Ferry Building after all. Despite the sizable crowd, my order was ready within minutes, I sprinkled a little mild green salsa on my tacos and grabbed a seat in the beautiful sunshine. So nice to be out of the office and eating tacos! Gorgeous weather aside, my tacos were tasty and the portions generous. Each corn tortilla was bursting with filling then topped with a little chopped onion and cilantro. The pork carnitas were quite good, almost as good as the carnitas my favorite taquería in Sacramento, and definitely the best of the three options. The braised short ribs were also tasty. They had the dark, meaty, beefy taste that I love about short ribs and the acidity of the salsa complemented them well. (Bias confession: I love braised meats almost as much as I love pork, and honestly can’t believe I was ever a vegetarian. Thank you Katie Norton, Jordan Seliger and Argentina for steering me right!) The vegetarian taco with beans, summer squash and salsa was also very good. Well-seasoned, substantial, and I enjoyed it as a break from the meats. Finally, the salsas … I tried the mild green salsa and the medium roasted red salsa. Both were good, but I favored the balance of green salsa. They complemented my tacos nicely. My only want … chips for dipping and a Jarritos Mandarina soda! Conclusion: I’m very picky about my mexican food, I know it pretty well, and I’ll be back. Here’s the deal. This is why I wanted to start a blog. Online restaurant reviews are hit and miss; it’s as simple as that. This review of two restaurants, Moussy’s and Nob Hill Grille, is a prime example of what can happen when you trust the common online restaurant review databases. Both have similar ratings; both are in a similar price range, have interesting sounding menus, feature small plates, and have a small, but tasteful wine list. The similarities end there. I’ll start with the bad news first. Moussy’s is located in Lower Nob Hill on Bush Street between Larkin and Polk. Emily and I decided to give this place a try on Saturday night because (I swear this is the last time I’ll say this) of its positive reviews on google, yelp, etc. We looked at the menu online and it seemed promising. Upon entering the cavernous dining room we were greeted promptly and seated at a table off the bar. The atmosphere was dark and intimate, but cozy at the same time. Definitely a place I could see myself in for a couple of hours enjoying some wine and relaxing. We sat down and looked over the paper menu and decided on a couple appetizers to start. The grilled oysters sounded nice, unfortunately they had just run out so we settled on the charcuterie plate. This is where things went downhill. The waiter took our order for the charcuterie and left. About ten minutes later we received a plate with four slices each of salumi, hot coppa and prosciutto, as well as a bit of grain mustard and some dried figs that tasted like they had been reconstituted in balsamic vinegar and honey. There was nothing terrible about the dish, but for $13 it was definitely lackluster. There was one star on that plate: the prosciutto. It was very interesting in that it had the usual porky goodness of your typical cured ham, but it was much spicier than most prosciutto. After taking our plate, the waiter continued to watch the Giants game before coming back to see if we wanted anything else. Unfortunately we did, and proceeded to order the grilled cheese, pomme frites, and the angus burger. First came out the fries with a spicy aioli ($6). The flavors were all there; a nice amount of seasoning on the fries and a good heat to the aioli. Unfortunately the chef had made an egregious error: some of the fries (and by some, I mean about 1/3) were STALE! Then Emily’s grilled cheese ($9) came. It smelled of melted butter and cheese; two of our favorite things, but it fell completely flat; it had absolutely no flavor. There was one upside to the evening, and that was my burger. I chose the aged gruyere and grain mustard aioli. The angus beef was very nicely seasoned and the brioche bun was soft and absorbed all the delicious juices. The gruyere and aioli did little other than add a creaminess. At $12 it was a tasty hamburger, if not the best value. Overall, the service was slow, the food was pretty bad, and most of the interesting items shown on their menu online were missing from the actual menu. On the upside, I liked the burger a lot and the atmosphere was nice, but the thought of stale french fries will keep me away for a long time. On a more positive note, Emily’s mom came into the city on Sunday and wanted to grab a bite close to our house; we decided to walk up to Nob Hill Grille at Pine and Hyde. Let me get some business out of the way first. Emily and I went to Nob Hill Grille on a whim a few weeks ago and really enjoyed it. One reason we went to Moussy’s was to do a little comparison, and going back to Nob Hill Grille was just a little bonus so I could give a fair opinion on both restaurants. We went in around 6pm for an early dinner and the tiny dining room was mostly empty. The decor is simple with a few black and white photos of San Francisco on the walls. It is a comfortable and inviting atmosphere; more classic than lush or trendy. We sat down and received water immediately, which was filled constantly by the attentive waitstaff. The three of us shared a number of small plates and we each had a glass of wine. Rich, one of the guys who runs the show, knew off the top of his head that they were out of the syrah I had selected and steered me toward the “Rubystone” ventenna blend, from Monterey ($10). Not the most balanced wine, but it was mild and paired well with all the dishes. Rich broke our meal of six small plates into two courses of three plates each. First we had the beet salad with warm goat cheese ($6), magic mac ($6), and the braised pork belly ($9). The salad was nice and classic, but nothing extraordinary. The magic mac (macaroni and cheese with house-cured bacon) was terrific: seasoned well, creamy and cheesy with a very nice brown crust on top. The pork belly is one of my favorite dishes that I’ve had recently. It is slow cooked to tender perfection and then is seared to order making the top super crispy. Thinking about it gives me a slight chill. It’s served over garlic mashed potatoes with wild molasses and stone fruit tapenade. This dish shows a lot of skill because these are some very bold flavors, but they are so balanced they complement each other beautifully. Another reason for me to praise this dish is the nature of the ingredients; obviously, by the name of our blog, we love pork, but when it comes to putting sweet fruit stuff in with it, Emily and I agree this is generally not right. The chef at Nob Hill Grille makes this dish so well that even with our fruity-phobia, we embraced the dish and loved it as if it were our own. Moving on. Next up we had the braised beef sliders ($9), special pasta ($? ), and sautéed french beans ($4) to make us feel a bit better about all the bacon. Starting with the beans, they are very good. Simple salt pepper and a little chile and maybe a squeeze of lemon. The pasta was orecchiette with bacon rapini and white wine butter sauce. The bacon was delicious, of course, and the sauce was mellow and blended nicely with the other flavors, but the pasta and the rapini were both a bit overcooked. The braised beef sliders were nice but not spectacular. I’m personally not a big fan of braised beef, but I can recognize when it’s done well and when it’s not. The beef here was done very nicely and the slaw was a refreshing match to the rich meatiness. Only one flaw really sticks out in my mind, and that is the choice of bun for the sliders; they were very hard and the meat slid off almost immediately. It was a decent dish, but I would much rather have twice as much pork belly. I’ll leave it at that. Pork (especially when it’s cured and from the belly) makes me like a restaurant! Seriously though, this is my first time writing a formal restaurant review and I hope my insights help someone make the right choice when finding a small bistro-style eatery in Lower Nob Hill.